A public (sometimes private) utility generates electricity and sends it to your home through overhead or underground wires called service conductors. At your home, the electricity goes through a meter, usually attached to the outside of the house, into the main, service entrance panel (SEP). The meter measures how much electricity your home uses during a certain period and you are charged accordingly. At the service entrance panel, which contains a main fuse or a main circuit breaker or a fuse/breaker system, the electricity is divided into branch circuits. The fuses or breakers protect these individual circuits. The branch circuits supply safe electrical power to the various rooms in your home: kitchen, bathrooms, living areas, bedrooms, and so on. Each circuit is protected by its own fuse or circuit breaker and is independent of the others. That is why, when something causes one circuit to fail with a blown fuse or tripped breaker, the remaining circuits are unaffected and continue to supply power to the other rooms. Electricity, as used in your home, is the rapid flow of energy transmitted by electrons. The flow must make a complete circuit from the utility's generating station, along the lines to your home, through your household circuits, back to the utility. The force that moves the energy is called voltage. The flow itself is called current. In alternating current, current reverses the direction of the flow of electricity constantly, 120 times a second. Each set of to-and-fro reversals constitutes a cycle. Alternating current features 60 cycles a second. Thus, we speak of 120- or 240-volt, 60-cycle alternating current (AC). Most homes built before 1941 had two-conductor (two-wire) electric service. If you live in a home built before then and the electrical service has not been remodeled, your home may have two-conductor service. In effect, one conductor carries 120-volt current and the other provides a return path. Actually, the current flow alternates in direction, along both conductors. 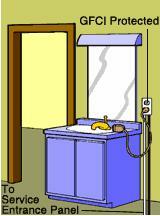 Two-conductor service may limit the number and type of electrical appliances you can use. Even if the utility ran a third line to increase your service, your existing circuits might not let you use many of today’s electrical conveniences. However, it may be possible to add new circuits capable of handling the current demands of new appliances. Consult your power company and a qualified electrician to determine whether your present service can handle an increased demand. Most homes have three-conductor (three-wire) service. Two of the wires are always "hot;" meaning power is always present. Hot wires are always colored. In a three-wire system, usually one hot wire is red and the other is black. The third wire, which is white or gray, is neutral and is not hot. 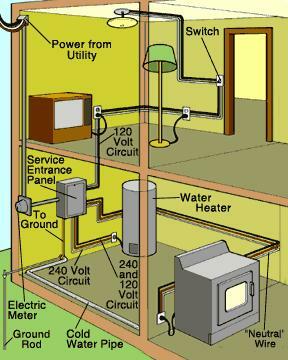 In a modern home running a 240-volt appliance circuit, the neutral wire carries no current. There are 120 volts between each hot wire and the "neutral" conductor, and 240 volts between the two hot conductors. Thus, there is power for lights and small appliances that require 120 volts, and for large appliances that require 240 volts. However, in a 120-volt appliance circuit, the neutral wire and the hot wire both carry current. Figure 1, the simplification of a house wiring system, shows the power split into 120- and 240-volt branch circuits at the service entrance panel (SEP). Black or red wires in the branch circuits are always "hot" (power present) and measure 110 volts to the neutral. White wires complete the loop to the SEP. They are "neutral" in respect to ground. Circuit breakers or fuses in the SEP protect the branch circuits from current overloads. The grounding system for metal switch and outlet boxes is not shown; it uses bare or green wires, or metal conduit. The overall system grounding connection, from the SEP to the cold-water pipe entrance is shown. A ground-fault circuit interrupter (GFCI) is a safety device that provides protection from electrical faults that could cause dangerous electrical shocks. It is designed to protect people from the dangers of leakage of electrical current that is seeking the easiest path to the ground. A GFCI continually compares the amount of current flowing through the black and white wires of a fixture or appliance circuit and disconnects the power to a receptacle if it senses a change indicating current leakage. There are three basic types: plug-in and wired into a conventional box (which you can install), and a main panel, whole-circuit model that should be installed by a professional. GFCIs are now required by The National Electrical Code (NEC) wherever receptacles are installed in kitchens, bathrooms, utility rooms, garages, crawl spaces, other wet or damp locations, and exterior installations.